Mastering grade 2 In 4 Out A/D D/A Converter with a preinstalled Thunderbolt interface card. Payments as low as $59/mo. Or, apply & pay as little as $59/mo. There are very few units that are truly “game changers” in the world of digital audio interfaces, and the Hilo is indeed one of them. No detail was left unattended on the Hilo, as the unit has an A/D converter for overdub tracking as well as a D/A converter for mix printing. It also has a separate D/A converter [which provides maximum performance capability] for the Hilo's monitor section, and yet another D/A conversion system for the headphone output! The design of the Hilo took over 3 years to accomplish. Every trace on the 8 layer PCB is the shortest run possible, and redundant copper ground planes were added for superior noise and cross-talk rejection. Unparalleled attention was paid to component placement to avoid the possibility of infinitesimal current leakage and the potential for capacitive irregularities between components. All of this adds up to one of the best sounding converter systems possible. The net result is spectacularly clear and detailed audio. The line inputs are fully balanced and buffered to provide high input impedance and rejection of common mode noise. The line output faithfully mimics the qualities of transformers using precision amplifier circuitry. Both the inputs and outputs exhibit an extremely flat frequency response of ±0.02dB of variation – and that's in the worst case! As a converter's full-scale signal level must match a studio's line level closely to minimize noise, Hilo provides eight standard trim settings on line inputs and outputs. To accomplish this, Telecom-quality relays with gold-plated contacts are used to avoid any additional distortion and/or noise that can be caused by other fain-switching methods that are commonly employed in lesser devices. Hilo also incorporates Lynx's proven SynchroLock™ sample clock, which generates an extremely low-jitter situation when syncing internally, as well as when syncing to external clock sources. Additionally, the BiLinear™ conversion technology was developed. Based on a completely differential topology that minimizes noise pickup and reduces harmonic distortion components, high-speed differential amplifiers are employed to provide an ideal interface for all your two channel conversion needs. This insures proper transient response, as well as the most linear audio possible. The ability also exists to pick up the output level by 14db to use the “monitor output” as an additional “line level” output, which adds to the overall flexibility of the Hilo. The real icing on the cake is the user interface, which employs a touch screen display for all your function selection, routing, and metering requirements. The metering options include both PPM [Peak Program Meters] for the input and output, as well as a “vintage” looking VU [Volume Unit] option that will supply the RMS metering option that is so important for understanding the true loudness of a mix. Between the superior sounding A/D conversion, amazingly stable clock, attention to detail on the build, ease of setup via the “touch screen” menus, a superior monitor output section that works in 1/2dB increments [like units that only have a D/A and cost 3 times more], flawless audio from the headphone output, and the planning ahead Lynx did with the Hilo's expansion slot [which will permit interface with any current and future format! ], all of your audio requirements are totally covered! 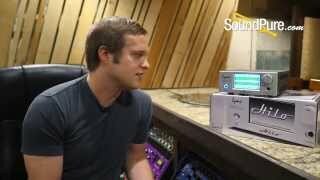 Lynx Studio Technology is proud to present the Hilo Reference A/D D/A Converter System. With the pristine, open, transparent audio quality for which Lynx is known, Hilo (pronounced HE-low) provides two channels of mastering quality analog to digital conversion, up to eight channels of digital to analog conversion, a secondary monitor output, and a world class independent headphone amplifier in a compact half-rack size. The Hilo is available for SoundPure’s Try-Before-You-Buy Program, so if you want to hear how this gear sounds in your studio with your gear, shoot us an email at ProAudio@SoundPure.com. Thanks for watching! The Lynx Hilo AD/DA Conveerter System was designed with audio mastering in mind. With exceptional specifications, extensive routing and control and its innovative operating system, Hilo is a great addition to any Mastering Studio. 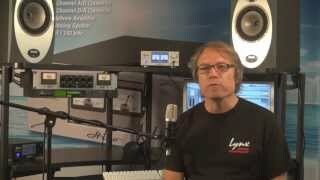 Lynx Director of Product Support Paul Erlandson takes you through a common setup. Lynx Studio Technology is proud to present the Hilo Reference A/D D/A Converter System. With the pristine, open, transparent audio quality for which Lynx is known, Hilo (pronounced HE-low) provides two channels of mastering quality analog to digital conversion, up to eight channels of digital to analog conversion, a secondary monitor output, and a world class independent headphone amplifier in a compact half-rack size. A first for the two-channel pro converter market, Hilo’s innovative 480 x 272 touchscreen provides a flexible and intuitive interface that can adapt to a particular application and be easily upgraded with enhancements and new features. Initial front panel controls support extensive signal routing and mixing, sample rate selection, clock source options, levels, metering and diagnostic features. Hilo completely redefines and evolves the category of the two channel converter. Of utmost importance is the audio signal quality. The completely new design of the analog stages and converter topology for Hilo break new ground in terms of lowering distortion and noise while maintaining transparency for A/D and D/A conversion. Beyond that, Hilo offers extensive I/O capabilities and utilizes the latest FPGA technology with vast resources for control, routing, and signal processing capabilities. Also in development are diagnostic and analysis tools for Hilo. The LCD screen is a natural interface for these functions. The digital or analog inputs can be routed to three separate outputs, Line Output (with 8 trim settings), Monitor Output, and Headphone Output. Each of these output pairs has its own dedicated DACs, allowing each to offer a unique mix. The Monitor and Headphone Outputs have volume controls, accessible via faders on the touchscreen or the single knob on the front (offering control in ½ dB increments). Another innovation, the Headphone section has its own dedicated D/A converter. This supports the creation of 32-channel headphone mixes independent of the main and monitor outputs, as well as providing specifications that rival those of dedicated headphone amps costing $1500 and more. The digital section offers a wide range of inputs. AES/EBU inputs and outputs have transformer isolated balanced XLR connectors. SPDIF input and output are available via transformer-coupled coax or optical (TOSLINK) connections. The Optical ports can also be used for up to eight ADAT channels. The ADAT input and output channels are completely independent from the AES/EBU or S/PDIF coax channels. Lynx’s low jitter SynchroLock word clock is also included, with Word Clock in and out connections available. In total, Hilo has 12 total inputs, 16 total outputs plus 32 channels possible via its LSlot port. The unit’s FPGA powers its internal 32 channel mixer, which allows Hilo to offer the most versatile I/O and routing in the two channel converter genre. This is just the beginning of the innovation. In contrast to the concentrated and intricate back panel, Hilo’s front panel is elegant in its simplicity. It has a power switch, headphone jack, multipurpose control and a 480 x 272 pixel high resolution LCD touchscreen. This high-resolution screen does a lot more than simply replace the buttons on the front panel of most other converters. Of course it handles the basic settings and routing functions, clocking and level settings. A second meter screen shows just two larger bar-graph style stereo bar meters. Any input or output set can be assigned to each meter. In addition to bar-graph meters common on most converters, Hilo’s touchscreen is able to show more traditional metering types, such as old style VU meters. Also in development are diagnostic screens, such as real time analyzer, phase meter and loudness meter. As with all other Lynx products, Hilo is FPGA based, meaning new features, capabilities and graphics can be added at any time with a simple download. The LT-TB is a two-port Thunderbolt expansion card that supports daisy-chaining Aurora and Hilo converters and any other certified Thunderbolt device on both Apple and Windows computers. The LT-TB and accompanying Aurora and Hilo models are the first Thunderbolt audio devices certified for Windows as well as Mac. The LT-TB, in development for over a year, uses Intel’s Cactus Ridge second-generation Thunderbolt controller. This device allows for a more robust design electrically. Similar to other Lynx products, LT-TB incorporates an FPGA for audio mixing and control functions that can be easily updated in the field. Months of in-house testing along with support from Apple and Intel assure that LT-TB works well with any other certified Thunderbolt product on the market. Whereas some earlier Thunderbolt equipped converters are limited to two units and 32 analog channels, the LT-TB can be used in a chain of up to 6 Aurora converters for up to 96 analog channels, plus 96 digital channels on one Thunderbolt port. So theoretically, the upcoming 6 port Mac Pro could deliver up to 1,152 channels. The Thunderbolt protocol allows up to six devices and one display to be connected to the computer on a single Thunderbolt port. So in addition to Lynx converters, you can have external drives, displays, expansion chassis and so on. The LT-TB has two Thunderbolt ports, which allows this daisy chaining of devices. One of the other nice features of the LT-TB and other Thunderbolt devices is the ability to plug, unplug and hot-plug them. So you can easily bring in an additional Aurora or Hilo or other Thunderbolt device without needing to reinstall drivers or reset anything. It’s all automatic. Thunderbolt technology is the fastest connection to your PC at 10Gbs – in each direction, and at the same time. This is twice the speed of USB 3.0. Thunderbolt provides flexibility and simplicity by connecting up to six data and display devices in a daisy-chain. Hilo can be powered by standard 110-230V AC power or remotely with 9-18 volts DC, allowing the use of standard video battery packs or even auto cigarette lighter connections. Hilo measures 8.50 x 3.25 x 10.00 inches, weighs 6.75 pounds and will be available with a silver or black front panel/knob option. Now available in Silver and Black, the US suggested retail price is $2495. #2 It is also a digital to analog converter. With most companies, these are two separate units. #3 It is an independent headphone amplifier. The headphone section has its own, dedicated D/A converter. This provides two key benefits. First this allows Hilo to offer a headphone output with exceptional clarity and noise specifications. Second, due to Hilo’s internal 32 channel mixer, any input set can be routed to the headphone stereo output. This means that a mix that is entirely different from the analog outputs and monitors can be applied to the headphones. Hilo is a 3 in one unit – AD converter, DA converter and Headphone with its own dedicated D/A converter. 12 total inputs, 16 total outputs plus 32 channels possible via LSlot. Open ended software for future measurement, metering, diagnostic and personalization features using the touch screen LCD.